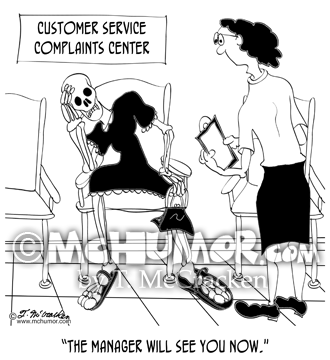 Customer Service Cartoon 8972: At the Customer Service Complaints Center a secretary says to a skeleton, "The manager will see you now." 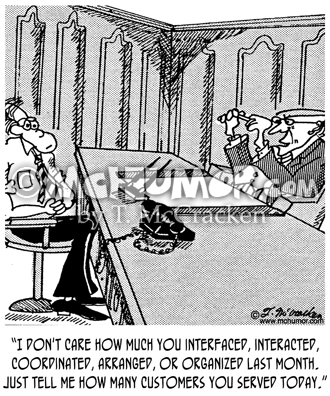 Business Cartoon 7208: A supervisor saying, "McWit, I don't care how much you interfaced, interacted, coordinated, arranged, or organized last month. 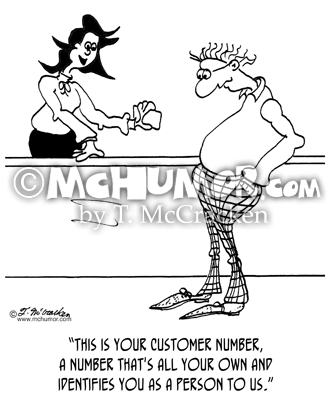 Just tell me how many customers you served today." Business Cartoon 6568: A clerk handing a customer a card and saying, "This is your customer number, a number that's all your own and identifies you as a person to us." 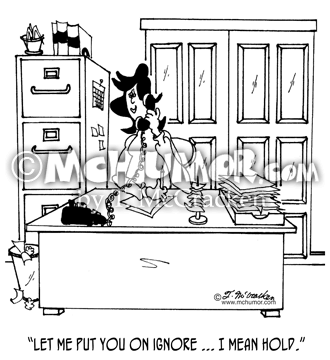 Business Cartoon 7210: A secretary on the phone saying, "Let me put you on ignore ... I mean hold." 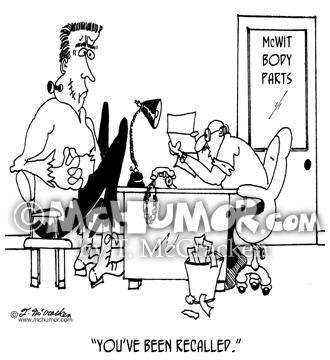 Business Cartoon 6954: A customer service representative saying to Frankenstein’s Monster, "You’ve been recalled. 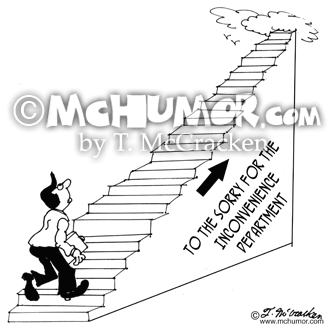 Business Cartoon 5959: A stairway going to the clouds has an arrow pointing the way "To The Sorry For The Inconvenience Department." 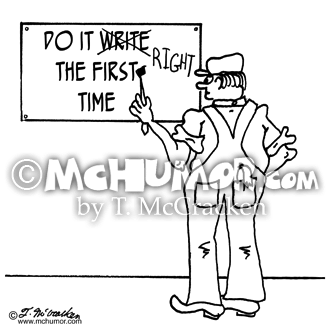 Spelling Cartoon 2422: A sign painter paints, "Do it write the first time." 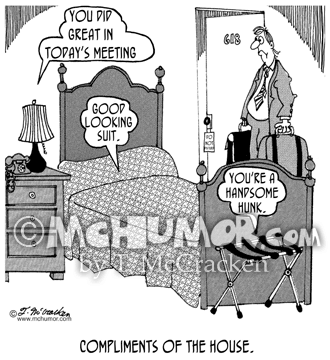 Hotel Cartoon 5219: "Compliments of the House." 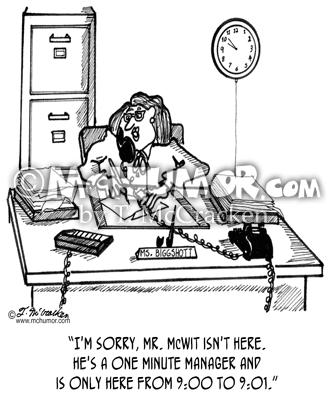 Someone enters a hotel room where the furniture is speaking saying: "You did great in today's meeting," "Good looking suit," and "You're a handsome hunk." 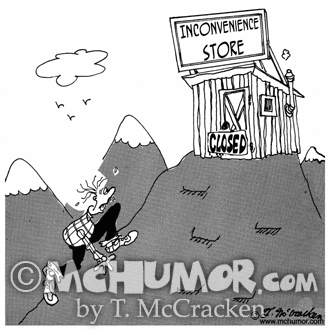 Store Cartoon 5052: A man climbing to an "Inconvenience Store" at the top of a mountain only to find it--what else--closed.